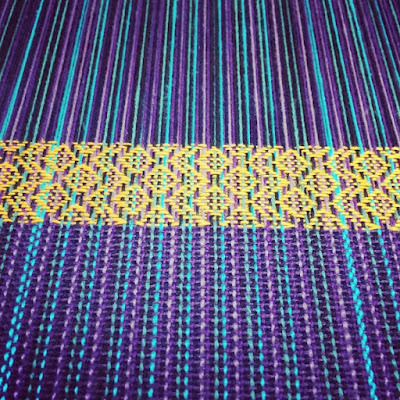 Time flies when there is weaving to be done. 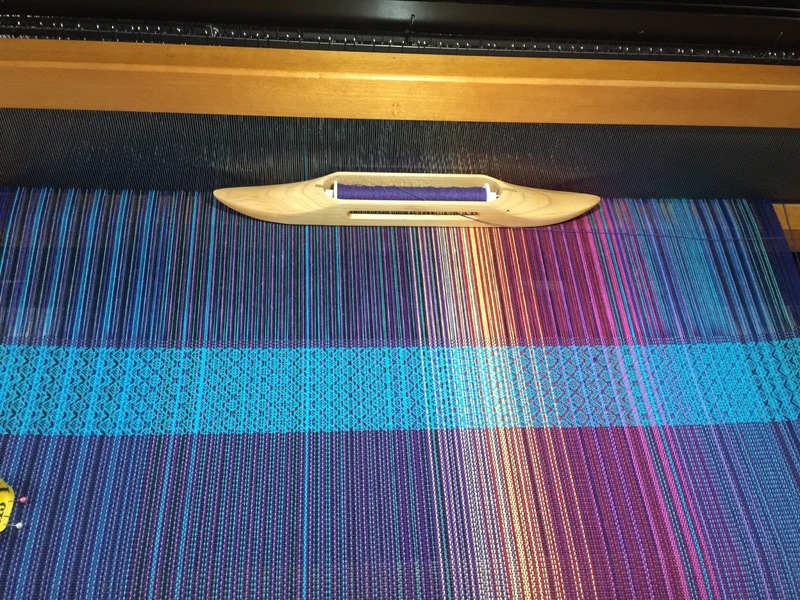 On July 9th, I put a 14-yard warp on the Macomber for a pair of baby wraps. 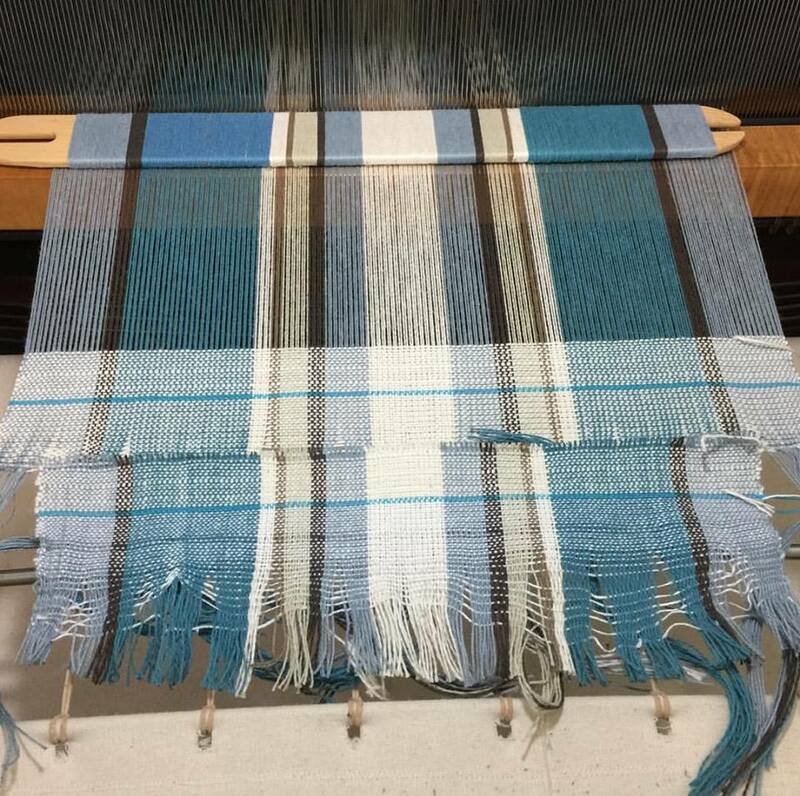 This loom presently has a plain beam, and I used a Glimkra mill to prepare the warp, using up to 12 threads at a time. 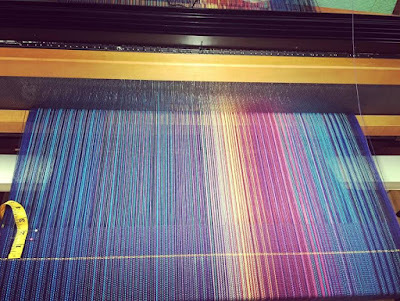 It must be my technique, because not only were the warp threads different lengths, but they were twisted, too, even with using a warping paddle. I used two crosses and warped back to front, but due to the different length/tension of each thread and the twisting, it took me a couple of hours a day for five or six days to get the yardage onto the back beam. 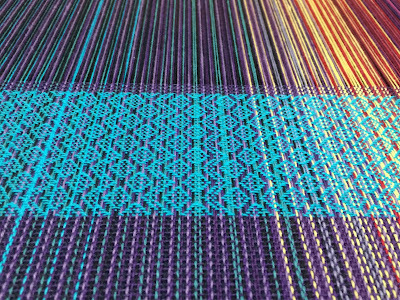 It was extremely frustrating and time-consuming, but I am pleased to say, with all that patience, I only snapped two warp threads. The end result was stunning, though. I have only had the warping mill since April or so. Prior to that, I had a Schacht warping board. 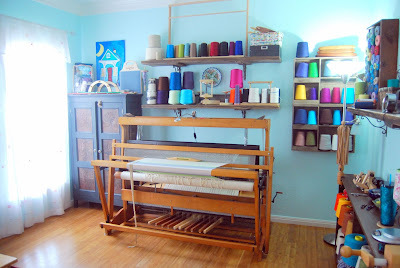 In fact, when I used the warping board, I did not have a problem with twisted or uneven length threads, at all. Part of the problem was trying to pull multiple threads evenly from the cone stand, I realize. 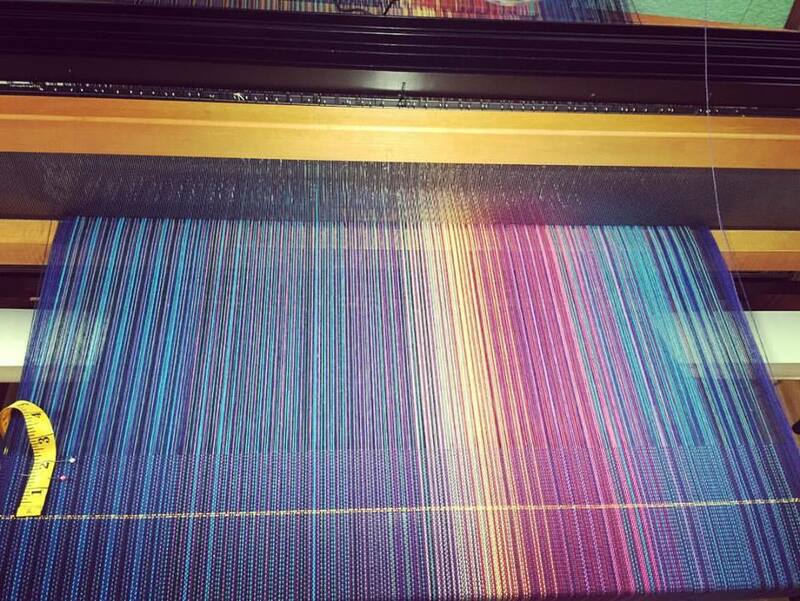 However, I think the warping board is more precise in the measurement of each thread. This is not the case with the warping mill due to the steel rod used as a bottom peg on mine. 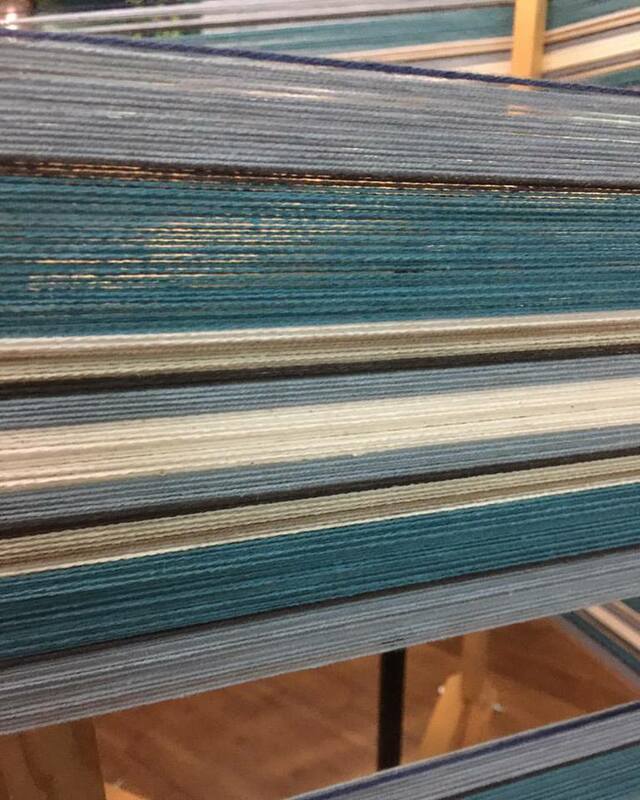 The threads build up at the end turn and each one is slightly longer than the one before it. While it takes a lot longer to warp with a single thread on the board, than it does to pull a single or multiple threads on the warping mill, that time (and much more) was lost to me in winding the warp onto the back beam. Because of this, as well as the purchase of a Leclerc Nilus with a sectional beam, I have been seriously thinking about converting the Macomber to a sectional beam, as well. To that end, I purchased a tension box with meter, spool stand, spools, and a double-ended electric spool winder with tension device. All that was quite an investment. The only thing that remains is a sectional beam for the Macomber. Of course, I could buy a sectional beam directly from Macomber and swap it out for my plain beam, but then I would have to store the plain beam somewhere. My second thought was to convert the existing plain beam by purchasing Leclerc rakes and installing them directly onto the beam. The Woolery has them. My back beam is 56" long, so I would have to buy the 60" ones, cut them down slightly, and attach them. 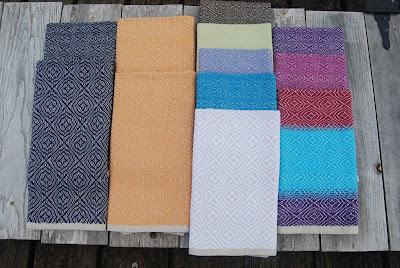 I was leaning toward this second option when I finished the baby wraps. The one with the blue center has already been gifted. The other is really long, but my friend is like 5'10" tall. I hope they get a lot of use. Once this project was complete, I prepared the warp for the next one, a set of place mats. I used the warping mill, but I pulled one thread at a time. I also used a double cross again. 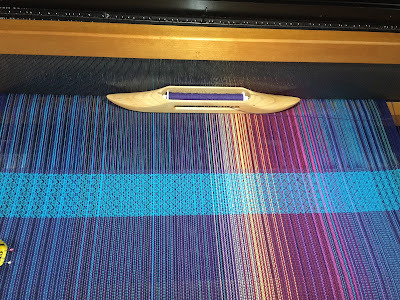 This time, warping onto the back beam was much easier; however, I did notice the threads were again different lengths. 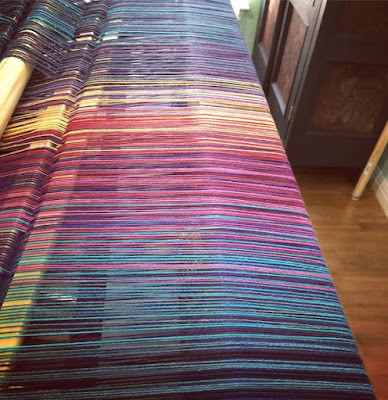 As there were only 286 warp ends, with help from the husband, it did not take much work to pull the uneven threads down as we wound. In no time, I had the heddles threaded and the reed sleyed. 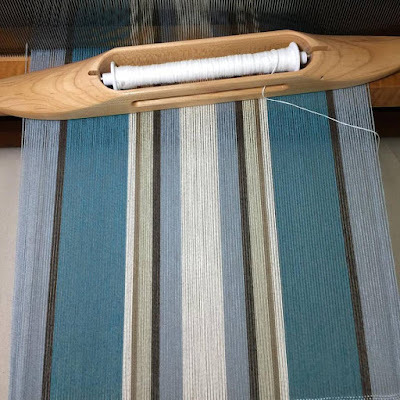 I closed the gaps with some waste weft, but there was not much more I could do, as the weft material (8/8 cotton from Camilla Valley Farm) was on order. The project should have been 14 inches wide, but it looked narrow to me. When I measured it, it was only 12 inches wide and barely that. I checked my numbers three times, and they were spot on. However, I used the wrong reed. I left the 12-dent reed in, when I should have switched it out for the 10 dent reed. My sett was 20 threads per inch. I cut off the end and re-sleyed the reed. THAT was much better! Fortunately, that mistake only cost me a few inches and less than an hour. 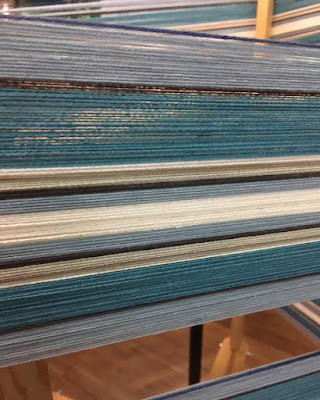 Twelve mats should take 9.2 yards with shrinkage, intake, and waste, but I warped 12 yards as insurance with the thought I may try napkins at the end of the warp. Once it was all done, I finally decided what I was going to do about a sectional beam on the Macomber. 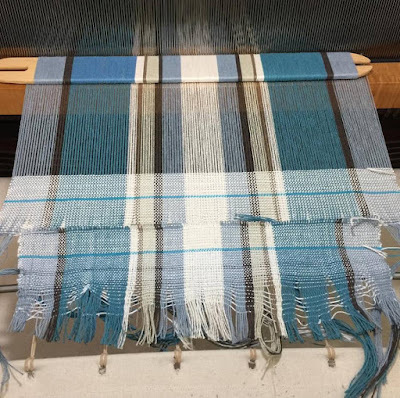 The logical thing to do is also the most expensive: add a second sectional beam to the loom. Yes, that means I am going to keep the plain beam (as well as the Glimakra warping mill and cone holder, instead of selling them) and add a second sectional beam with new tension brake system below the original plain beam. 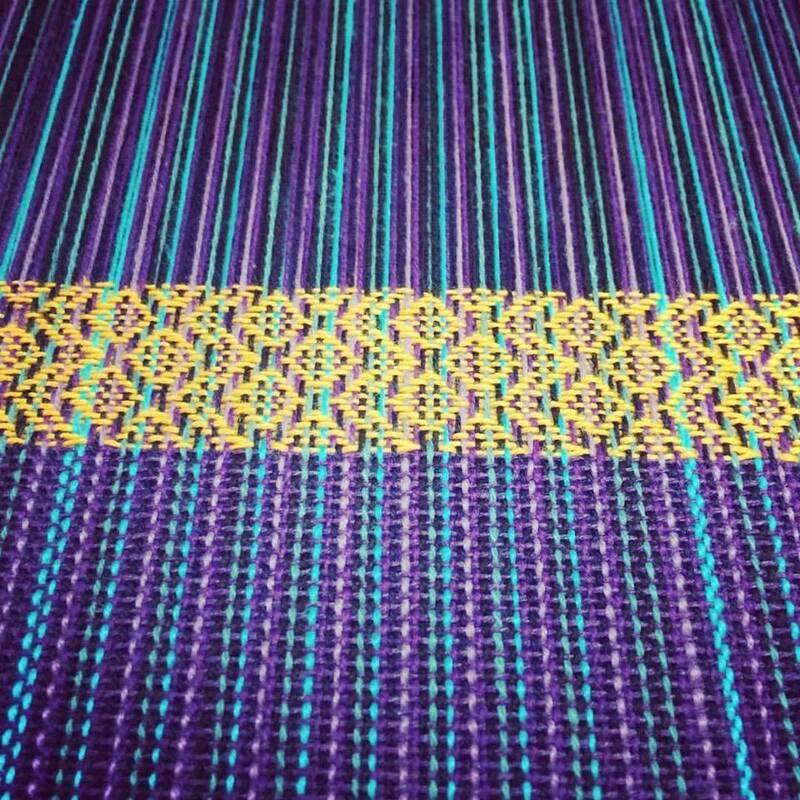 Not only will this allow me to do double weaving (something I have not yet become interested in doing), but I can use either beam (and warp plainly or sectionally), as the project dictates. Following an email discussion with Macomber, they advised they were not scheduled to make beams again until October/November. All things considered, I am very pleased with the decision. 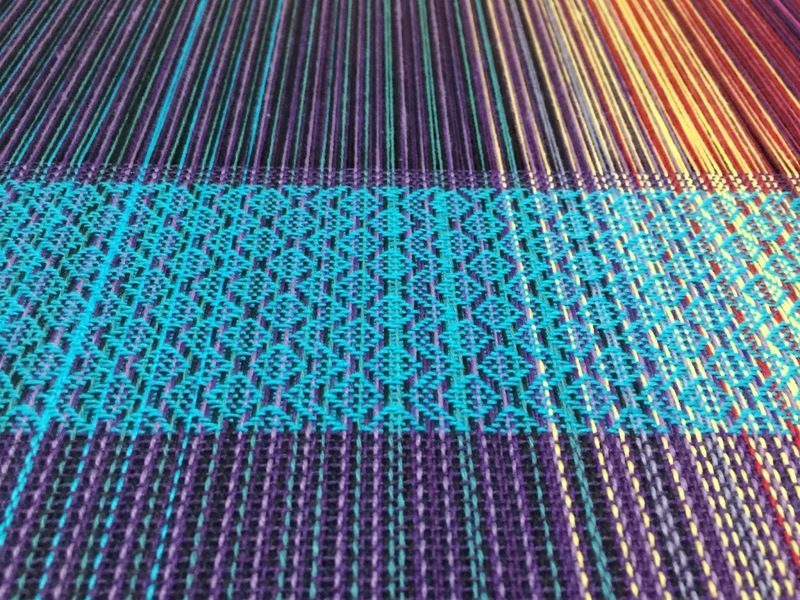 There is nothing you will ever do to warp that will have your tension always be perfect. You know how yarn is. Even inelastic yarn will have a bit of stretch, especially over 12 yards. If you watch the Vavstuga video, using a warping trapeze, it may help you. Go to http://www.vavstuga.com/minimovies/ and scroll down to Vavstuga demos and how to playlist. Select #14 and watch it. If you have lease sticks and just don't touch your threads at all, they will magically untangle. Then, when you tie on, you can tighten up any of the little vagrants that are driving you nuts. And, I would think you could make a warping trapeze for nothing! 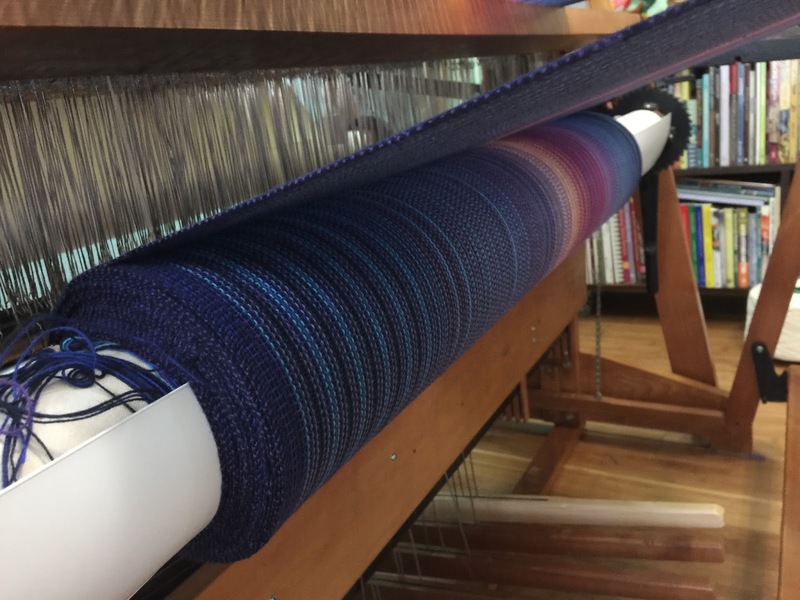 Also, I've never used a warping paddle, but we were taught at Vavstuga to use at least two threads to four threads at a time for speed and to keep it more even. Actually, watch all of their videos. You'll learn a ton!!! You amaze me!!! What you've picked up on your own and so quickly is crazy!